The board of directors of the Mountain Rides Transportation Authority voted unanimously Wednesday to continue bus service for fiscal 2015 at near the same level that the organization had for the past year. The Mountain Rides FY2015 Service Plan was fine-tuned following approval of a $2.5 million operations budget by the board in September. The new budget is about 4 percent higher than the fiscal 2014 budget, despite earlier fears that didn’t materialize of a cut in funding from the Federal Transit Administration. Mountain Rides also waited for public comment before finalizing a service plan, holding public workshops for comment in both Ketchum and Hailey on Sept. 25. The board heard two comments at Wednesday’s meeting, both of them complimentary of Mountain Rides services. The group uses the Mountain Rides’ Red Route extensively during the ski season for transportation to River Run for skiing or to Ketchum for shopping. “This is a big thank you for keeping our service intact for the coming ski season,” Galloway said. The new service plan makes minor adjustments to some of the Mountain Rides routes. Those changes will be listed in a new schedule released prior to implementation of the plan on Thanksgiving weekend. Mountain Rides provides free bus service in the Ketchum-Sun Valley area on its Blue and Green routes, with its Red Route added during summer and winter peak tourist seasons and its Silver and Bronze routes added for skier transit in the winter. The organization also provides paid-fare Valley Route service connecting the Bellevue-Hailey area with the Ketchum-Sun Valley area, free around-town service in Hailey on its Hailey Route, and compensated van service providing transportation to workers between the Magic and Wood River valleys. In other business, the board gave favorable reviews to a concept design for a planned south valley transit center. 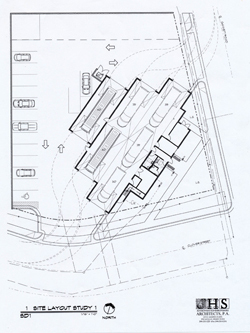 The plan, developed through contract to JHS Architects in Pocatello, shows the transit center building on a slant pattern on a half-acre property that Mountain Rides recently bought for the facility in Bellevue on the north side of Clover Lane where it intersects Gannett Road. Keeven Shropshire, one of the owners of JHS, explained to the board in a telephone conference call that the slant allows for easier access for buses. The concept design still needs to be approved by the Bellevue Planning and Zoning Commission before more detailed engineering plans are developed for the facility. The concept design provides for indoor parking for up to six Mountain Rides buses and has maintenance and wash bays, storage rooms, outside parking for up to 16 vehicles and a second-story living area including a living room, deck and three bedrooms. Mountain Rides has $950,000 budgeted for the facility, including $800,000 in grant funding from the Federal Transit Authority. Construction of the facility is planned to begin in the spring. In further business, Mountain Rides Operations Manager Jim Finch told the board that ridership in September was up 12 percent from September 2013. The largest increases were on the Hailey Route, which was up 40 percent, and the Valley Route, which was up 26 percent. Finch credited part of the September increase to new student rider agreements in place with the Community School in Sun Valley and Syringa Mountain School in south Hailey. Overall, Mountain Rides is showing an 8 percent ridership increase in the first three quarters of 2014 compared to the previous year. “We’re hoping to hit 500,000 rides this year,” Finch said.